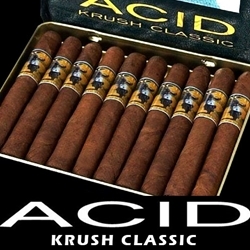 Acid Krush are hand-rolled premium cigarillos crafted with mild US Connecticut wrappers enriched with Nicaraguan tobacco fillers, each infused with essential oils, herbs and botanicals. Known the world over for their unique flavor profile, infused Acid cigars have somewhat of a cult following and are popular among the younger crowds. Available in four different Classic varieties including: Blue Connecticut, Gold Sumatra, Morado Maduro, and Red Cameroon.